Building situated on the Intracoastal. Elegantly furnished one bedroom co-op with Ocean and coastline views. Updated apartment with high impact windows and balcony door, ceramic tile and new appliances. 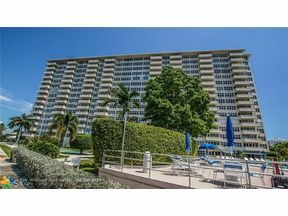 Terrific location at Ft Lauderdales North beach & Galt ocean mile. Only steps to the Beach, Banks, shops and fine dining.